The University of Hawai‘i at Hilo 2012 Awards and Recognition Celebration was held on May 8 at the Campus Center Plaza. The following were recognized. The 2012 Koichi and Taniyo Taniguchi Award for Excellence in Innovation was awarded to Lorna Tsutsumi (center), professor of entomology, for her work on food sustainability, bees and beehives. Toby Taniguchi (left) helped present the award along with Chancellor Don Straney (right). Student Employee of the Year: Ho‘oleina Ioane*. Award for Excellence in Building and Grounds Maintenance: Gordon Mitchell*. 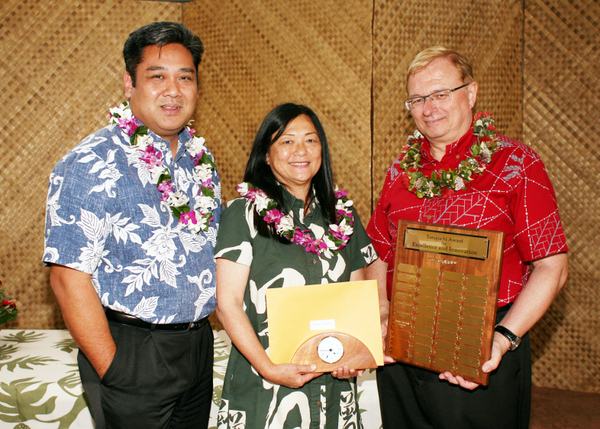 This award is presented to a building or ground maintenance employee who has made significant contributions UH Hilo. Award for Excellence in Service: Seri Luangphinith. This award is presented to a UH Hilo tenure-track or full-time BOR-classified professional staff member who provides service related professional skills to the University of Hawai‘i at Hilo and the community. Pūlama ‘Ike Award: Tim Moore*. This awards is presented to an individual who has made a significant contribution to developing and promoting the mission and spirit of the University of Hawai‘i at Hilo. Koichi and Taniyo Taniguchi Award for Excellence in Innovation: Lorna Tsutsumi*. This award recognizes the creative use of technology in teaching, scholarship, research and artistic production by fulltime faculty or staff at UH Hilo. This list covers the period from May 2011 through April 2012. Anyone retiring after April 30 will be recognized at next year’s event. Dwayne K. Branco and Paul Texiera, who both worked in Auxiliary Services. Dwayne and Paul transferred to UH Hilo in 2009 when the state closed down a branch of the Forestry Agriculture program, where they both cut and maintained walking trails in the state parks on island. Dwayne retires with a total of 30 years of service, and Paul with 37. Luke Bailey was an instructor of English and served at UH Hilo for a total of 13 years. His area of emphasis was in teaching composition. He was director of ESL Program and coordinator for TESOL Certification Program. He is currently in Sweden. Barry Curtis was a professor of philosophy at UH Hilo for 36 years. He won the 1980 UH Board of Regents Medal for Excellence in Teaching. John Ige worked his way up at UH Hilo over the course of 15 years. He started as an emergency hire working as a janitor, and then became a permanent employee. In 2007, he transferred to a groundskeeper, and in 2008 became our painter, until his retirement April 2011. John is enjoying his retirement and now has more time for golf and house projects. Sonia Juvik* was a professor of geography for 31 years. Her research interests are in land use, planning, and resource use in the regions of the Hawai‘i, Australia, and the Pacific Islands. She founded UH Hilo’s Keaholoa STEM program, now used as a model STEM program throughout the country. The Atlas of Hawai’i, for which she was co-editor with her husband Jim Juvik, is the foremost atlas of our state. In 2011, she received the UH Hilo Chancellor’s Certificate of Recognition for her contributions in preparing student scholars to thrive, compete, innovate and lead in their professional and personal lives. Charles Langlas was an associate professor at Ka Haka Ula ‘O Ke‘elikōlani College of Hawaiian language. He specializes in Hawaiian culture and history, nineteenth century texts, and oral history. His ethnographic work with Native Hawaiian elders and other Native Hawaiians from Puna resulted in several publications and a DVD about traditional fishing. He now lives on O‘ahu. Keith Miser* served for seven years as UH Hilo vice chancellor for student affairs and three years in international programs. He leaves a legacy of countless students and administrators who have benefitted from his encouragement, support, and endless energy. He represents what is best in education: the desire to give others the opportunity to benefit from new opportunities. Henrilene Pickens was an office assistant at Student Services. She served at UH Hilo for 22 years. Henri embraced all new students to UH Hilo by welcoming them to her home for holiday gatherings and developed excellent rapport and relationships with many of their families. Jean Shimose served at UH Hilo in diverse capacities over the course of 27 years including at Nā Pua Noʻeau Gifted and Talent Native Hawaiian Program when it first began on our campus over 20 years ago; Auxiliary Services; the College of Agriculture, Forestry, and Natural Resource Management; and the dean’s office at the College of Arts and Sciences. She is an extremely talented lei maker, flower arranger and decorator and did the decoration at UH Hilo’s graduations, holiday celebration and other events for many years. Becky Thurston was an instructor of psychology. She served at UH Hilo for 15 years. She was an undergraduate at UH Hilo over 25 years ago and then returned as a lecturer and instructor. 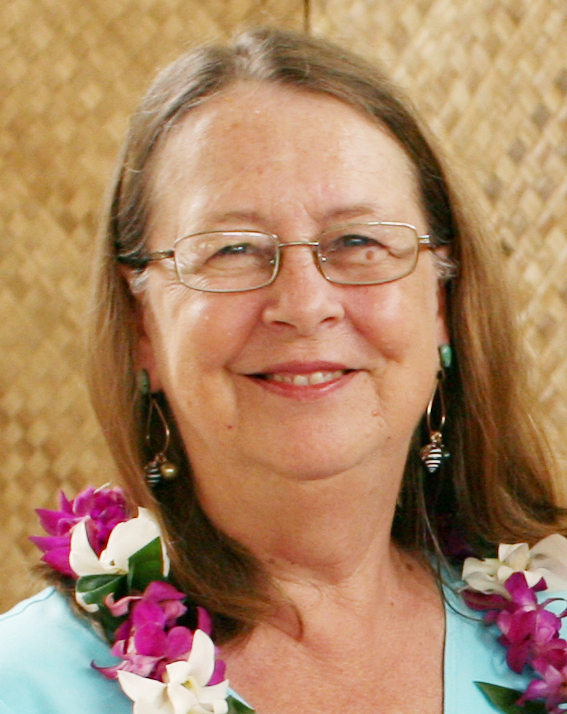 She received the UH Hilo Chancellor’s Award for Excellence in Teaching in 1999. She was devoted to teaching, but she was also a devoted athlete, including surfing, golfing, swimming, and paddling. There will be 727 candidates for degrees and certificates at University of Hawai‘i at Hilo’s spring commencement to be held May 12. Hawaiʻi Lt. Governor Brian Schatz will deliver the keynote address, and Anthony Holzman-Escareno, an English major with a minor in philosophy, will be student speaker. As lieutenant governor, Schatz played a leading role in preparing for the Asia Pacific Economic Cooperation Summit held in Honolulu last year. He also launched the Hawai’i Fair Share Initiative, which seeks more private and public investment in Hawai’i. He is currently tasked by Governor Neil Abercrombie with helping lead the state’s clean energy efforts and Asia-Pacific relations. Holzman-Escareno has maintained a cumulative grade point average of 3.95 and earned a number of academic honors. He is on the dean’s list for the College of Arts and Sciences, is a recipient of a Howard and Yoneko Droste Award to recognize outstanding student writing, and is published in the academic journal Hohonu. He is editor-in-chief and sports editor for the student newspaper Ke Kalahea. Holzman-Escaren arrived at UH Hilo through an unconventional process. He entered college with no high school diploma or GED. He passed the compass test to gain admission to Hawaiʻi Community College, and later transferred to UH Hilo. He’s now waiting word on his applications to several law schools. He describes UH Hilo as a place where dreams can be conceived and realized. He says the caps and gowns his fellow graduates will don are a testament to their determination and will to succeed. Commencement is scheduled for Saturday, May 12, at 9:00 a.m. at Edith Kanaka‘ole Stadium. May 12, 2012: Story in the Hawaii Tribune-Herald on Anthony Holzman-Escareno. The University of Hawai‘i at Hilo’s mission is to challenge students to reach their highest level of academic achievement by inspiring learning, discovery and creativity inside and outside the classroom. Our kuleana, or responsibility, is to improve the quality of life of the people of Hawai‘i, the Pacific region, and the world. One of the most urgent needs of our local community is in the area of rural health care. To answer this crisis—which includes a dire shortage of health care professionals—UH Hilo is developing and sponsoring myriad educational, support, and outreach programs. For example, four of the most recently approved degrees at UH Hilo are in health care, including a doctor of nursing practice program. The DNP has been approved by the UH Board of Regents and by the Western Association of Schools and Colleges. The program will begin August 2012 for post-baccalaureate students and will be open to post-master students in August 2013. To support UH Hilo undergraduate students interested in receiving a doctor of pharmacy from the university’s College of Pharmacy, there is a mentoring program for up to five students per year. The Steps Towards Excellence in Pharmacy program, or STEP, is an intensive, three-year scholarly preparatory program to address underserved students’ educational, social and economic needs. Mentoring is in the form of advising and learning specialists, as well as support from faculty members in the pre-pharmacy program. The STEP program is modeled after the successful Imi Ho‘ola Program at the John A. Burns School of Medicine at UH Mānoa. Priority is given to applicants with strong ties to the state of Hawai‘i and US-affiliated Pacific islands, and students who successfully complete the STEP program are ensured a seat in the College of Pharmacy. This type of bridge program creates a pathway for local students to reach their academic goals so they can receive an advanced degree and then dedicate their professional lives to helping their communities. This is a program that has the potential to change the lives of many families in Hawai‘i. This month, the UH Hilo School of Nursing will sponsor the “Pūlama I Ke Ola Healthcare Conference” for professionals, which also includes a youth program to inspire high school students to pursue a career in health care. Speakers and discussions will focus on current research and clinical practices integrating holistic health concepts to improve health care on our island. Special attention will be placed on health care issues impacting the health of people living in multi-cultural milieu in Hawai‘i and throughout the world. The program will provide updates on current issues and trends affecting health care, and those attending the youth program will have the opportunity to interact with health care clinicians on an informal basis that engenders a meaningful learning experience. UH Hilo seeks to reflect Hawai‘i, its people, history, cultures, and natural environment, and to embody the concept of a “Hawaiian university.” As a member of the UH System, we embrace our responsibility to serve the indigenous people of Hawai‘i and to kāko‘o or support Hawai‘i’s indigenous language and culture. This responsibility also extends to our efforts in strengthening our rural health care and health care system. For example, in July, Nā Pua No‘eau, a statewide organization based at UH Hilo aimed at raising the educational achievements of Native Hawaiian children throughout the state, will be hosting the “Learning Opportunities in Medicine Institute,” a two-week residential program held on the UH Hilo campus. Hawaiian students in grades 7-12 from around the state will engage in hands-on field experiences, cultural activities, and personal development designed to show how they can make a difference in their community’s health care system. A Native Hawaiian component will be integrated in all the classes to provide students with Hawaiian role models, culture, values, history, protocol, and language. Speakers will include experts in the fields of medicine and health care from UH Hilo’s College of Pharmacy and Department of Nursing, the John A. Burns School of Medicine Native Hawaiian Center of Excellence, and the Health Careers Opportunity Program. These are just a few examples of the way UH Hilo is fostering educational opportunities for a robust rural health care system and revitalized local economy. For more updates about UH Hilo, visit my blog.